The synthetic NCAM-derived peptide, FGL, modulates the transcriptional response to traumatic brain injury. Cerebral responses to traumatic brain injury (TBI) include up- and downregulation of a vast number of proteins involved in endogenous inflammatory responses and defense mechanisms developing postinjury. The present study analyzed the global gene expression profile in response to cryo-induced TBI by means of microarray analysis. Adolescent rats were subjected to TBI and treated with either placebo or a neural cell adhesion molecule (NCAM)-derived fibroblast growth factor receptor (FGFR) agonist, FGL peptide, which has been demonstrated to have neuroprotective effects. mRNA levels were measured at various time-points postlesion (6h, 1 day and 4 days). The effects of injury, treatment, and injury-treatment interaction were observed. TBI alone rendered a large number of genes affected. Analysis of lesion and treatment interactions resulted in a clear effect of the interaction between injury and FGL-treatment compared to injury and placebo-treatment. Genes affected by TBI alone included inflammation markers, protein kinases, ion channel members and growth factors. Genes encoding regulators of apoptosis, signal transduction and metabolism were altered by the interaction between FGL-treatment and TBI. FGL-treatment in non-injured animals rendered genes regulating signaling, transport and cytoskeleton maintenance significantly increased. 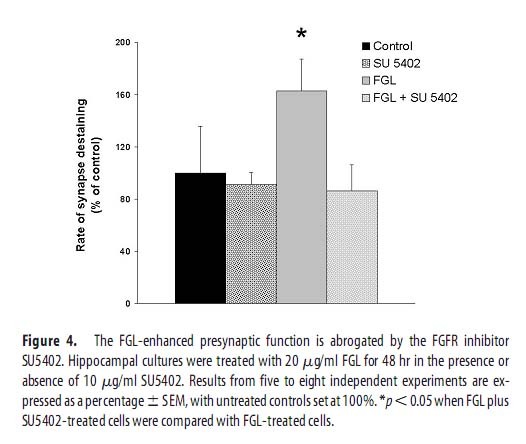 Thus, the hypothesis of a putative neuroprotective role of FGL was supported by our findings. 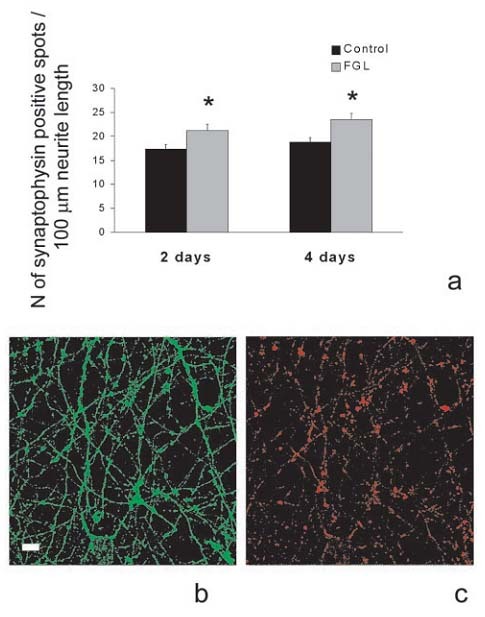 Pedersen MV, Helweg-larsen RB, Nielsen FC, Berezin V, Bock E, Penkowa M. The synthetic NCAM-derived peptide, FGL, modulates the transcriptional response to traumatic brain injury. Neurosci Lett. 2008;437(2):148-53. A peptide motif from the second fibronectin module of the neural cell adhesion molecule, NCAM, NLIKQDDGGSPIRHY, is a binding site for the FGF receptor. The mechanism of fibroblast growth factor receptor (FGFR) activation by the neural cell adhesion molecule (NCAM) is not well understood. A motif in the second NCAM fibronectin type III (FN3) module, termed FGL, has by means of nuclear magnetic resonance (NMR) and surface plasmon resonance (SPR) analyses been demonstrated to be involved in NCAM-FGFR interactions. An FGFR activation motif (FRM) in the first NCAM FN3 module also has been suggested to take part in NCAM interactions with FGFR. Here, we show for the first time that a peptide motif in the second NCAM FN3 module, different from the previously described FGL motif (NLIKQDDGGSPIRHY; termed BCL) binds and activates FGFR and induces FGFR-dependent neurite outgrowth in cultures of cerebellar granule neurons. Our results provide evidence that the BCL motif is one of the multiple FGFR binding sites in NCAM. Jacobsen J, Kiselyov V, Bock E, Berezin V. A peptide motif from the second fibronectin module of the neural cell adhesion molecule, NCAM, NLIKQDDGGSPIRHY, is a binding site for the FGF receptor. Neurochem Res. 2008;33(12):2532-9.